Looking to get a little more creative with student work this year? Allowing students to step outside the publishing box not only teaches them some cool new tech tools, but more importantly, it also helps them consider important (yet often overlooked) elements in their work such as audience, tone and imagery. It's time to go beyond the word processing and slideshows. These 3 tech tools can help with that. Adobe Spark is a publishing trio that includes Adobe Spark Post (static and animated graphics), Adobe Spark Video (video creation), and Adobe Spark Page (dynamic web pages). 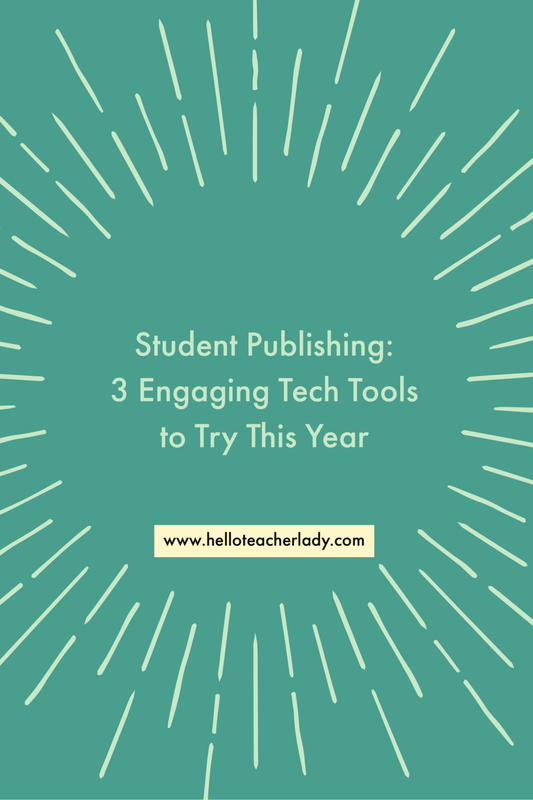 All three tools are easy to use and visually engaging, which make them the perfect publishing tools for students. I first wrote about the power of publishing student writing using Adobe Spark Video at the end of the 2017 school year. At the last minute, I completely redesigned my 8th grade “I Believe” unit to include a video publishing component. Despite some initial apprehension from students who cringed at the thought of hearing their own recorded voices, we powered through and the results were inspiring. Read more about that experience, along with some tips & tricks, here. Need more Spark publishing inspiration? Adobe Spark Post: flyers for school events, public service announcements, one-pagers, blog/social media graphics, memes, animated graphics to insert in video projects, book recommendations, book covers, and news announcements. Adobe Spark Page: photo journals, personal or fictional narratives, essays, digital portfolios, event pages, newsletters, and pretty much anything that used to be a slideshow. Adobe Spark Video: graphics and/or short video clip compilations, narrated short stories or smaller pieces of writing, book trailers, “iAm” videos, six-word memoirs, personal statements, news reports, and vlogs. Video discussion platforms are a great way support student voice in the classroom. Flipgrid is one such platform that allows students to showcase their thoughts and learning while sharing ideas, recommendations and more. Teachers create a “topic” with a particular prompt — share the best book you’ve ever read, talk about a time you made a mistake and learned something, etc. — and students record a short video in response. Their video is then uploaded to a shared space for all to view. To record, students need the Flipgrid app or a desktop computer with a webcam. Students can record and re-record their videos as many times as desired, which helps them feel more comfortable with the process as a whole. When they’re done, they snap a quick selfie that appears as a thumbnail on the topic screen. Teachers can alter settings to monitor submissions, enable “like” buttons, allow video responses, and more. You've probably heard the hype, but might be apprehensive in giving it a try. What if students don't buy in? What if there's not enough time? What if it's tricky to set up? What if the kids have trouble filming? I get it, I had a lot of the same concerns. But with any new tool or experience, you have to start somewhere. And often times, you're glad you did. Flipgrid first entered my classroom at the start of the 2017-2018 school year: Eager for a way to discuss and share book recommendations with others, our #bestbookever topic was born. After assigning the prompt for the first time, I gave students class time to write and plan out what they wanted to say. I set aside some time the following two days for students to practice and/or film their videos in the hallway. Some students also opted to record in the comfort of their homes, while others paired up at lunch to support each other. In the end, I was so impressed with the quality of my students' videos. They were confident, prepared and well-spoken. And the best part: some of my quietest students shined the brightest. It was eye-opening and inspiring. Students can access the grid or topics at any point through a specific link, but it's also super easy to create QR codes through the Flipgrid teacher dashboard. This enables you to create interactive displays, like the one pictured above. I've also used Flipgrid as a way to collect videos that students were recording on a recent field trip. They were already uploading them to Snapchat throughout the day, so why not create a space that gives their videos a more collective and permanent home? Make sure to visit the Topic Discovery Library to see how teachers around the world are using Flipgrid with their students. With a classroom green screen, the possibilities are endless. Students can create unique video projects — news reports, announcements, book trailers, commercials, sports commentary, historical reports, research presentations, interviews, etc. — while employing some fun techie skills in the process. My journalism students have been enjoying our green screen as they create a variety of news and YouTube-style videos with our class iPads. There are several free green screen apps out there, but we've been using the DoInk app ($2.99) and it has worked out perfectly. Of course, you'll need to record your video in front of a green or blue screen. I purchased this (affiliate link) green screen from Amazon and love it. My students and I had to watch a YouTube video to figure out how to fold it up, but now we’re pros. Just fold it like a taco, step, fold, twist! If you’re not ready to invest in a green screen just yet though, grab some green butcher paper from the copy room (be careful of wrinkles) or use a green sheet (if you happen to have an old one lying around). Have you tried any of these student publishing tools yet? Which new tool are you most excited about trying? Share in the comments!